Mike Blyth is flying dangerously low over the Sudanese desert, but he cannot see the ground. He and his Trike Microlight are enveloped in a sandstorm, man and machine almost choking on red-brown dust. Worse, he cannot see his companion, Swiss Microlighter Oliver Aubert. Their aircraft could be kilometres or only meters apart. "Mike? Do you have me visual?" 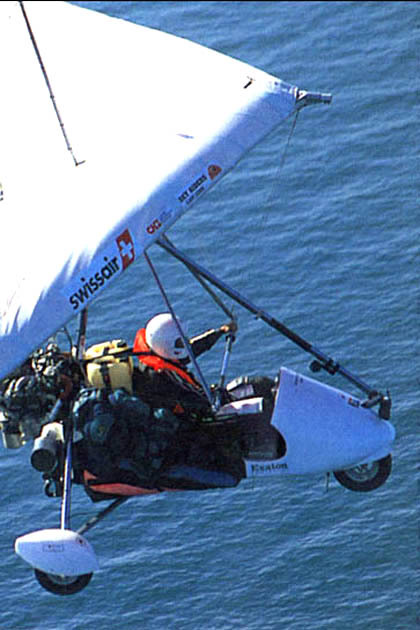 Aubert's voice crackles through the two way radio mounted on the front of Blyth's microlight. "I am 194.5 kilometres from Port Sudan and I'm 6.4 kilometres right of track. Where are you?" Aubert says. Blyth's position is only 600 meters away. He radios Aubert: "How high are you?" "I'm at 213 meters. You're still not visual," says Aubert. Ok, keep flying straight," says Blyth, blindly trying to guide Aubert through the turbulent, burning sand. I'm going to turn off right. I'll try to see you coming past me. "Blyth makes a slow circle to the right, steering clear of Aubert's track. If they collide or clip wings the expedition will be over. The sandstorm was just one of the dangers SA microlighting champion Blyth, 41, and Aubert, 38, overcame during an epic 23 000-kilometers flight from the southernmost city in Africa, Cape Town, to the northernmost village, North Cape in Norway, this year. Only days before the sandstorm, about two month's into the expedition, they were confronted with another dangerous situation in Sudan. Aubert crash landed and flipped his microlight in the scorching afternoon sun. Blyth landed and helped Aubert right his lane, but the pilots did not have permission to land in politically fragile Sudan. If the microlight were seen on the ground both pilots would be arrested. Airport officials were waiting for them in Port Sudan and what should have been a six-hour leg now topped 10 hours. Blyth and Aubert were frantic when a search plane made radio contact: Zulu Uniform, Alpha Romeo, Echo, do you copy?" asked the Sudanese pilot, The two pilots, still on the ground, hurriedly threw a T-shirt over the radio and spoke from a distance, hoping to simulate an airborne reply. "We've met strong headwinds. We've been delayed. Do not send out a search and rescue party. We're on track," Blyth answered. It was the first day he recalled Aubert being "shaken up". It was not the last. The greatest challenge still lay ahead ? 600 kilometres crossing of the Mediterranean. A mistake over the sea could be fatal and a back-up plan was essential. 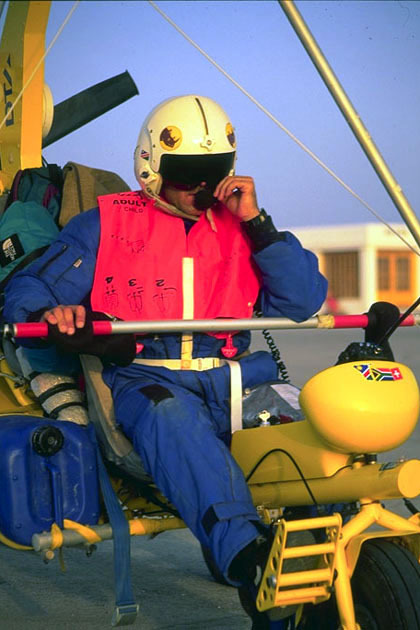 They took one Emergency Location Indicator (ELI) with them, which Blyth carried on his microlight. If he went down, he had only to clutch it in his hand. If Aubert was forced to crash land in the sea, Blyth had to drop the ELI, accurately as possible, into the water so that Aubert could grab hold of it and turn it on. The pilot who remained airborne would have only enough fuel to circle the sinking microlight for 30 minutes, noting the exact location before heading towards the nearest base Cairo of Crete. Half of the flight across the sea would be out of broadcast range, making any search and rescue difficult. The stranded pilot could spend up to six hours in the water before help arrived. "Both of us were mentally and physically prepared for it," said Blyth. "I sat very still and made sure I didn't fiddle with anything," He did not eat or drink. The only movement he made was to alleviate his full bladder with the use of a long pipe and a bottle. They completed the crossing in 9 hours, landing safely in Crete. Not all the flights were an ordeal; they also experienced the breathtaking beauty of Africa. Blyth expected to see a semi-desert landscape on the dawn flight from Bethuni to Sossus Vlei over Namibia soon after the start of the trip, but was pleasantly surprised. "What started to unfold in front of us was a countryside of short, light coloured grasslands and sharp black peaks jutting into the skyline. To the left were orange dunes, the colour of the sun set. The air was still, still, still." It was not just the stillness that captivated Blyth. It was also the "comfort zone" he experienced. 'The engine was purring, there were few vibrations, and because of the nice weather we were flying low." Blyth sat back and relaxed, one finger on the controls. Easy stuff - he even cracked open a Coke. Many African nights were slept beneath the aircraft wings on rural landing strips - thin welts of civilisation in the thick bush. Eager volunteers (Friends made in a day) and security guards armed with AK 47's kept watch over their valuables. Only a pair of hiking boots went missing. Landing in Africa took much skill. All trees, shrubs and water were avoided - and spectators had to be dodged. At times, several hundred people spilled from dusty village roads onto the bushveld strips to watch the microlights touch down. The first time this happened Blyth felt intimidated. But he soon grew familiar, and sometimes frustrated, with the all-too-eager spectators. That's when Aubert took control. Dressed in helmet and flying suit, he once stepped like an alien from his microlight and marched towards the crowd. He crouched at their feet and, with his right forefinger traced a line around the planes in the dirt. "No closer," he warned them, and the crowd stood back. Food and fuel was always a concern. Both pilots took few reserves with them, carrying no more than 440 kilograms on board, including body weight, fuel tanks and navigation equipment. If their were towns and huts nearby, one pilot stayed with the microlights while the other headed toward the building by foot or taxi - often a wooden bucket bound by wire, balanced precariously on two weary car tyres and drawn by a donk ey or horse. If the field was close enough to the town, Blyth and Aubert would remove the wings from their microlight and carefully taxi their undercarriages through the streets, keeping one hand on the engine and switch and their eyes on the road, searching for children and dogs running awkwardly close to the propeller. After navigating the Mediterranean, they crossed the French Alps, passing over icy gorges and snowy mountain caps where Aubert dropped 914 meters in minutes as he battled to start his frozen engine. Finally they reached Oslo, where they handed a letter written by the mayor of Cape Town to the mayor of the Norwegian City. 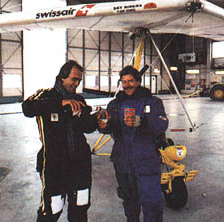 At 2pm on August 6 1995, Aubert and Blyth reached North Cape, 120 days and 23 000 kilometres after leaving Cape Town. They had clocked 280 hours in the air - and set a world record. No microlight had covered this route before. They had averaged 400 kilometres a day at 95 kilometres an hour, crossing desert, lake, ocean, mountain, and pain. Exhausted and exhilarated, they derigged their microlight and caught a ferry through Norway's fjords. Then it was homeward bound. Although the expedition had been physically demanding, the greatest challenge took place in their minds, said Blyth. "The long hours seated in a flimsy aircraft required considerable mental stamina and discipline. For one third of the flight you are sitting in mental anguish ... you're flying into unknown conditions, you know you can have structural problems." But for Blyth, the enjoyment surpassed all fear and anxiety. "Everyday you'd wake up, plan your food, fuel and flying, looking forward to new experiences. It was an adventure, the living of really extraordinary experiences. It had its high and low moments, but everyday I felt:' I can't believe this is happening to me. I can't believe what I am going through'." Click here to read the fax Mike and Olivier sent home on completing the expedition.